Mark English (right) competes at the indoor championships next year. THERE WAS MORE good news for the Irish team at the World Junior Track and Field Championships in Barcelona. 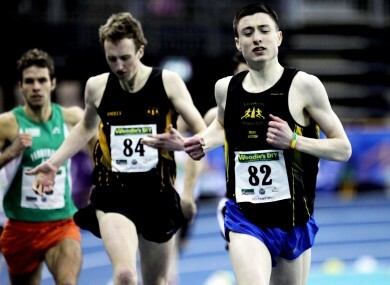 Irish Junior Record Holder Mark English won his 800 metres heat and qualified for the semi-finals of the event. The Letterkenny Athletic Club runner crossed the line in a time of 1:51.74 and was declared the winner after Fiker Belete of Ethiopia was disqualified. It later turned out that Belete was disqualified for a lane infringement, which meant English was declared the heat winner. The 19-year-old was in the middle of the pack after 200 metres and managed to stay with Belete when the pace was increased in the final lap. Karl Griffin, of Tir Chonaill AC, was also competing in the 800m but finished seventh in his heat. Sarah Lavin finished third in her heat of the 100m hurdles to qualify automatically for the semi-finals. Lavin, with Emerald AC in Limerick, made a positive start to the race, according to an Athletics Ireland spokesperson, and moved over the barriers with great fluency. The race was won by Michelle Jenneke in a time of 13.52, while Lavin recorded a time of 13.90 for third place. The semi-finals are scheduled for 5.35pm (Irish time) on Saturday. The results follow on from the positive outings from Joanna Mills and Ben Kiely earlier in the championships. The pair made it to semi-finals of their respective track events but Mills could not up her performance levels sufficiently to make the 400m final. Email “Young Irish track stars progress to world championship semi-finals”. Feedback on “Young Irish track stars progress to world championship semi-finals”.